Approximately 40,000 people die by suicide in the US each year, and there are dozens of friends and family members in the wake of each loss. World Suicide Prevention Day is on September 10. On this day, 30% of proceeds from my book A Different Kind of Same will benefit the Alliance of Hope for Suicide Loss Survivors. Learn more about how you can get involved here. When my brother died by suicide eleven years ago, I was gutted by grief. I fell into a deep depression. I couldn't keep a job, I struggled to maintain relationships, and my health suffered. I felt completely alone--but I wasn't. Approximately 40,000 people die by suicide in the US each year, and there are dozens of friends and family members in the wake of each loss. Thankfully, there are more resources to support loss survivors than ever before. One of these fantastic organizations is Alliance of Hope. Ronnie Susan Walker MS, LCPC, a grief counselor from Evanston, Illinois, founded Alliance of Hope for Suicide Loss Survivors in 2008, after losing her stepson to suicide. 1) Tell us about Alliance of Hope--how does it work? The Alliance of Hope provides online healing support for people who've lost loved ones to suicide. Each day, newly bereaved loss survivors from across the globe reach out to us for help. Most feel devastated, guilty, and alone. Over the last eight years, hundreds of thousands of people have accessed our resources to help them get through the darkest time of their life. Our website contains information to help survivors understand the complex emotional aftermath of suicide. It also features a blog, bookstore, and memorials. Our community forum functions like an online support group, available 24/7/365. It hosts over 8,000 members from around the world and more than 190,000 commentaries describing the survivor experience. It is supervised by a mental health counselor and trained team of survivor moderators who provide information and hope. Many members use it as a supplement to counseling and support groups, and many say it is their lifeline. We also provide low cost phone and Skype video consultations to survivors. We offer these services for the long-term--helping survivors move through every step of the healing journey toward living a meaningful, productive life again. 2) What inspired you to create Alliance of Hope? When my stepson Channing took his life at age 21, I was unprepared for the roller coaster of emotions that followed. Within a few months, my marriage ended and I entered a period of despair. I was frightened and angry. I felt guilty and powerless. My sense of possibility and desire to participate in the world around me were gone. I was numb, obsessed with thoughts and emotions related to the suicide, wondering - even two years later - if I would ever feel inspired, joyful or powerful again. Little did I know then that there were millions of other suicide loss survivors experiencing the same kind of devastation. Years past and thankfully, I did grow stronger and began to counsel other survivors. At that point, about 10 years ago, I noticed a void in suicide bereavement care. There was little quality information on the web. Services were scarce. And most importantly, there was a lack of "hope" in the culture that surrounded survivors. The prevailing conversation at support groups and in most literature at the time was: "You never get over it - you just learn to live with it." I wanted to shift that culture to one of more possibility: the possibility of surviving and eventually going beyond "just surviving" to a have happy, meaningful and contributory life. The idea of using the Internet to serve the unmet needs of loss survivors, was intriguing. In the beginning, I didn't know if it would work - but it did. Today we serve thousands of people across the planet who use our community forum like a 24/7 support group. And each year, hundreds of survivors write to thank us for being there - for "saving their lives" in the aftermath of loss. 3) There are a lot of articles on how to support a survivor that you have a personal relationship with, but are there things that we as a society can do to support survivors? Yes, absolutely! We can increase public awareness about the plight of loss survivors. The suicide of a loved one catapults those closest onto a challenging grief journey. It fractures the foundation of Life as they have known it. Survivors are filled with debilitating emotions as well as symptoms of post-traumatic stress disorder. For a while, survivors may have difficulty functioning at the same level they did prior to the loss. Compassion and understanding from the community makes an enormous difference. Another important thing we can do is expand training for mental health practitioners at all levels. The vast majority have received no formal training on suicide aftercare. 4) It seems that more and more survivors are opening up about their losses. 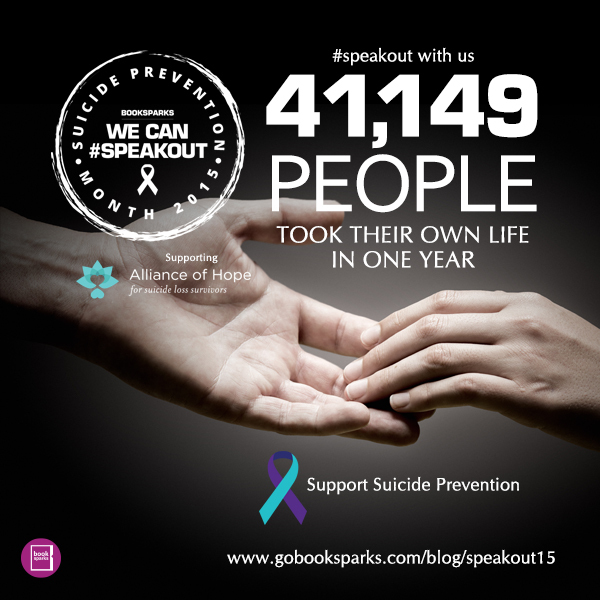 Do you feel the stigma surrounding suicide has decreased? How much further do we have to go? Things have shifted significantly -- away from the days when suicide was considered shameful and covered up. Increased openness in society, combined with the context of "mental illness as cause" have broadened our ability to speak about things that were previously "hush hush." That said, many loss survivors still have enormous difficultly opening up about their loss. Sometimes it's simply too painful to talk about. Other times, they don't know how to talk about the death and fear that they or their loved one will be misunderstood or judged. 5) Support for survivors usually falls under the category of "postvention." Is there an overlap between prevention and postvention? If so, where does it lie? Absolutely. Postvention is definitely prevention. There are more than 4.7 million suicide loss survivors in the US alone, and they are one of the most easily identifiable high-risk groups. One study shows that adult survivors are nearly 10 times more likely than the general public to consider suicide in the initial months following loss. Earlier this year, the National Action Alliance for Suicide Prevention released guidelines urging "drastic action" to provide comprehensive, effective support for suicide loss survivors; they've been neglected for too long. 6) How do you think grieving a suicide is different than grieving another type of loss? Suicide is a shocking loss. It's traumatic. And it leaves one with complex, debilitating emotions. I've sometimes said that when someone dies by suicide, it's as if a grenade goes off - leaving everyone wounded - and struggling to survive. Survivors must grapple with the loss of someone they loved, as well as guilt, blame and symptoms of post-traumatic stress disorder. On any given day on the Alliance of Hope forum, many survivors post that they feel "hopeless, scared, and alone." Over the years, I've noticed that when someone ends his or her life, those left behind are pulled out of Life as well. The residual pain is great. They struggle to survive. Sometimes in the beginning, it is a matter of one hour at a time. It's hard to envision a future. That's one reason we find it so important to provide hope to new survivors, at the Alliance of Hope. 7) If there were a single piece of advice you could share with a new survivor, what would it be? I often talk with new survivors and suggest that they spend some time reading our website and community forum. Both contain a wealth of information on paths to suicide as well as the survivor experience. And I recommend that they consider joining and tapping into the strength of the forum community.